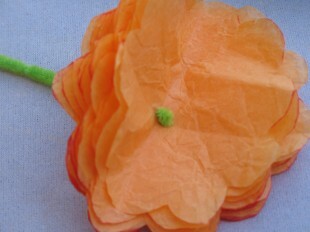 First find a sheet of colored tissue paper and fold it into a 2″ – 3″ square. 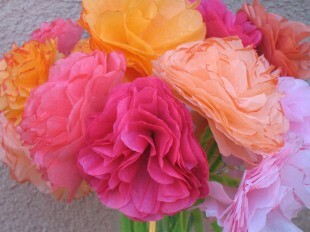 Any old wrinkled tissue paper will do, in fact the more wrinkled, the more character your rose will have. 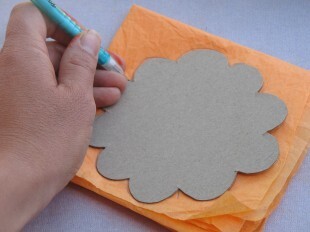 Next, you will need to draw a freehand flower shape, with about 10 petals, onto a piece of cardboard. Cut out this shape. This will be your template. 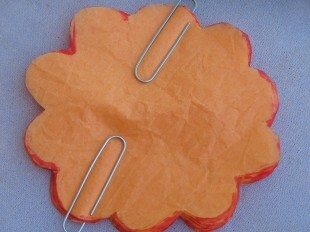 From this template, trace the flower onto your folded piece of tissue paper. Cut out the traced flower. Now you can remove the paper clips and fold the paper in half. 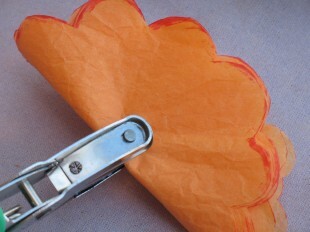 Punch a hole about 1/2″ away from the middle of the folded edge. 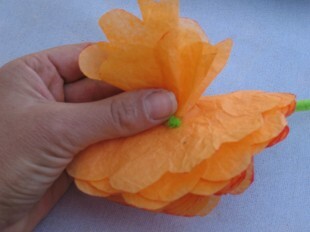 Open up each layer of paper, one by one, folding the paper inward and up as you go, in a whimsical organic fashion. 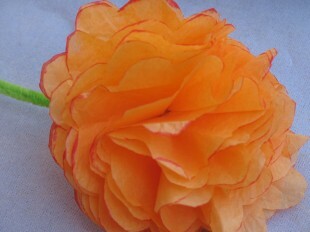 Once all the petals are open, you can reshape them to make a full rose shape. I love these! Thanks for showing us how. oh, this is so much better than the fan-fold style I’ve done with kids! and I love the dark edging, beautiful. thanks for spelling it out so clearly. we’re going to have fun with this! These are the prettiest I’ve ever seen. The details you add, like the color around the edges, make things so special!